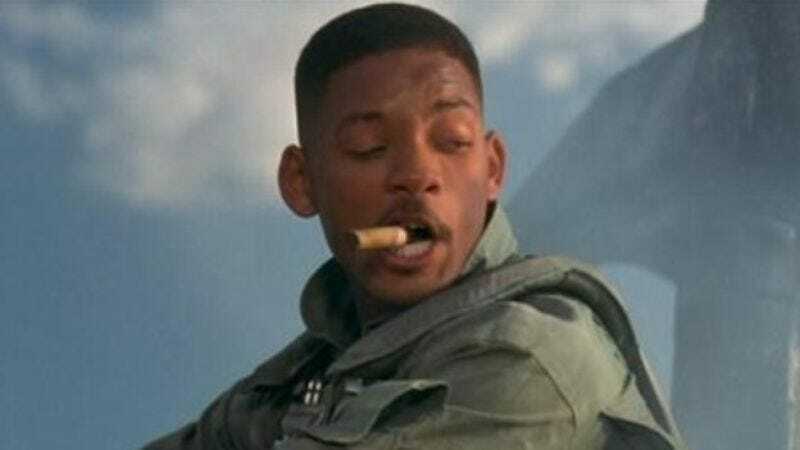 A sequel to Roland Emmerich’s 1996 blockbuster Independence Day has supposedly been in the works since Clinton’s second term, though it existed only in the realm of the hypothetical as Emmerich concentrated on blowing things up in other movies. Way back in the fall of 2011, it was reported that Fox expected to have scripts for two back-to-back sequels by the end of that year. Today, Entertainment Weekly reports that Emmerich and co-writer Dean Devlin have completed scripts for ID Forever Part I and ID Forever Part II and passed them along to writer-producer James Vanderbilt for a rewrite. Vanderbilt worked with Emmerich on the upcoming White House Down—not to be confused with the current White House-in-peril movie Olympus Has Fallen, because Emmerich can’t get enough of destroying that place. The gist of the new scripts: The aliens from the original Independence Day sent a distress call to their home planet, but because of the great distance between the two worlds, it took 20 years for reinforcements to arrive (via wormhole, naturally). In the meantime, humans have tried to duplicate the alien technology—there’s something about an antigravity device—but we haven’t succeeded too much. And because star Will Smith hasn’t signed on (we can only speculate about why), the new films will focus on a new generation of characters. “It’s still some of the same characters, but also new, younger characters,” Emmerich said. “It’s a little bit like the sons take over.” That includes Will Smith’s stepson, played in the original by Ross Bagley, who was last seen in a 2004 episode of Judging Amy. Bill Pullman, who played President Thomas Whitmore, has committed to the film and probably at least one more inspiring monologue. And because Emmerich doesn’t worry too much about spoilers, he added, “The first [sequel] ends on a little success, but only enough to give the humans hope. And then in the second one they free themselves again [from the aliens].” Aww, we thought the aliens would win this time. There’s no word on when production on the films would begin, so expect another update sometime in 2015.